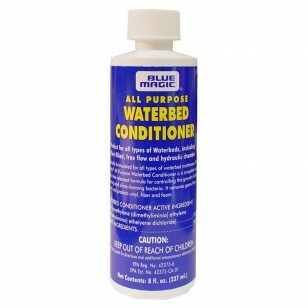 Blue Magic Waterbed Conditioner is designed to control the growth of odor-causing, slime forming bacteria. It will extend the life of the vinyl and fiber inside your waterbed mattress when used as recommended. Without conditioner, your vinyl waterbed may dry and crack, not to mention the foul smell that will result from untreated water. Each 8 ounce bottle of waterbed conditioner treats your mattress for up to one year, depending upon mattress type and size. If you are using well water, consider doubling or tripling the amount of Blue Magic Waterbed Conditioner, because there is more active matter in untreated well water.